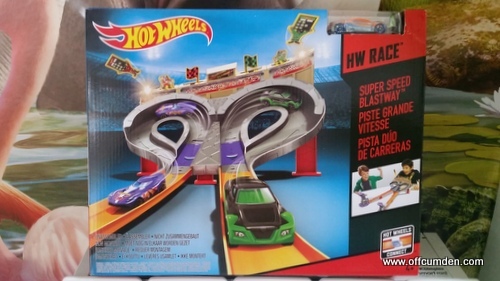 We were recently sent the Hot Wheels Super Speed Blastway to review. My son and daughter both love Hot Wheels, so were excited to try it out. They are also both incredibly competitive (I don't know where they get it from), so were looking forward to competing against each other! The Hot Wheels Super Speed Blastaway comes with all the track you will need and one car. Luckily we already have quite a few other Hot Wheels cars, so we grabbed one from the toy box. 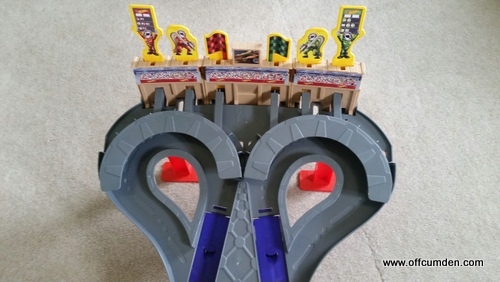 The track was very easy to put together and only took around ten minutes, which is a record for me putting Hot Wheels tracks together! Often I find the instructions really confusing, but this wasn't the case this time. Once set up, the children picked their sides and placed their cars at the beginning of the track. The fact that they can sit next to each other and both race at the same time is great. The characters at the top of the grandstand pop out and the chequered flag which pops out shows which team has won. Both children loved playing with the trackset and they managed to keep their competitiveness friendly! This set is suitable for children aged 4+ and the RRP is £22.99. 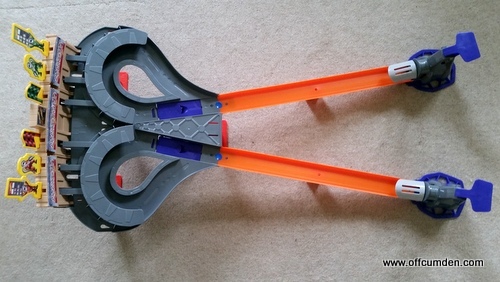 I thought this trackset was good fun and the children certainly enjoyed playing with it. 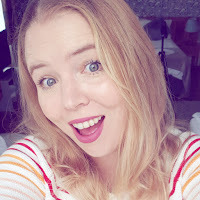 My only reservation is that the race is over in a matter of seconds, and it doesn't connect to any other tracks, which means it stands alone. There's nothing wrong with that in essence, it's just a matter of how long your children will stay entertained by a toy where the race is over very, very quickly. For more information, check out Hot Wheel's website. If you have HotWheels fans in your house, then they can now also own the t-shirt. HotWheels have teamed up with Zara and have t-shirts in three different designs. My son was sent the yellow one and it looks fantastic. I love how the t-shirt has a metallic effect on it. For more information and to check out the t-shirts, visit Zara's website.